Go Directly to Our Marketplace Click To Shop Now! We are the Memorabilia Experts. Our business is to auction any type of sports memorabilia and celebrity collectibles with the emphasis on sports, for personal collectors, estates, charity’s and fund raisers. 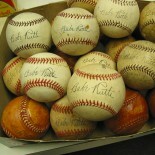 BidAMI -Memorabilia.Expert is the place that speaks of extraordinary collectibles, unparalleled service and expertise. We are the popular place to showcase the unique and beautiful in a fun and interactive manner. BidAmi Auctions has the international allure because of its international alliances. Our clientelespans all over the globe. We are familiar with the sales of estates from Johnny Unitas Family, Raiders Jack Tatum Estate, Mickey Mantle Greer Johnson Estate, Dominique Wilkins Estate, Penny Marshal, Pittsburgh Pirate Dock Ellis, Rick Moser, Frenchy Fuqua, Amos Otis, Denver Bronco’s Craig Morton, Mike Easler Playmate of the year Brande Roderick and Bob Bourne. We also accommodate the average collector and offer them a marketplace to sell and authenticate their items on the on-line auction. BidAmi Auctions always has something for everyone. It’s fun and easy to BidAmi Auctions. Authentication and offering the best quality collectibles will keep the customer’s coming back while developing trust. Integrity is instilled by offering quality authentic products, ease and facility of a great state of the art on-line auction site. Products are marketed to the elite collector all over the world via the web, our elite database of collectors, and VIP’s. BidAmi merges hall of fame artifacts, athlete appearances, live broadcasting within an interactive, personalized sports fantasy on-line experience. BidAmi is a lot of things but its not one of these old stale and static auction sites. With the Las Vegas touch, BidAmi Auctions does everything different starting with its Quick Bid to the latest in the High Tech and Interactive Social Media experience. Our services will include appraisals, experts available to authenticate, and evaluators estimating the collectibles worth in order to get the collection ready and marketable for the on-line auction. I have two original paintings by Ferdinand Pacheco, Magione Duet and Cousteau of the Deep, which I’m thinking about selling. Do you also collect, buy/sell these items? Or do you know of anyone interested in Pacheco’s work? Thank you very much. Yes, our collectors buy Art. We also Buy and Sell.. via auction or straight sale.. Give us a call 888-308-9714… we will also contact you as well. Hello, I have. 2002 Vintage Aces Roger Clemens short print card. Can not find any information on it anywhere, except for that it was short printed. Maybe you can help? E mail back and I can reply with the pictures! Excellent, what a webpage it is! This web site gives useful facts to us, keep it up. Hi. I had received the Super Bowl trophy signed by the HOF Joe Montana. Thank you so much Memorabilia Expert for sending my most prized 49ers posessions up to date safe and sound. Very professional in dealing with their business. Looking forward to do more in the near future. Highly recommended.